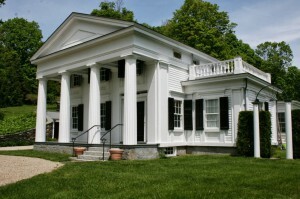 The Hudson Valley is well known for its many well-preserved older homes, especially in the Georgian, Federal, Colonial Revival and Greek Revival styles. Built-in gutters, also known as box gutters, are one of the distinguishing features of these houses. This type of gutter is designed to be hidden from view, so as not to detract from the beauty of cornices and other architectural details of a historic home. However, being hidden also means that deterioration and damage can go undetected until a major problem arises. Our company has been called on to repair or replace many built-in gutters over the years, and I thought it might be a good time to address a few questions about them. What is a built-in gutter? 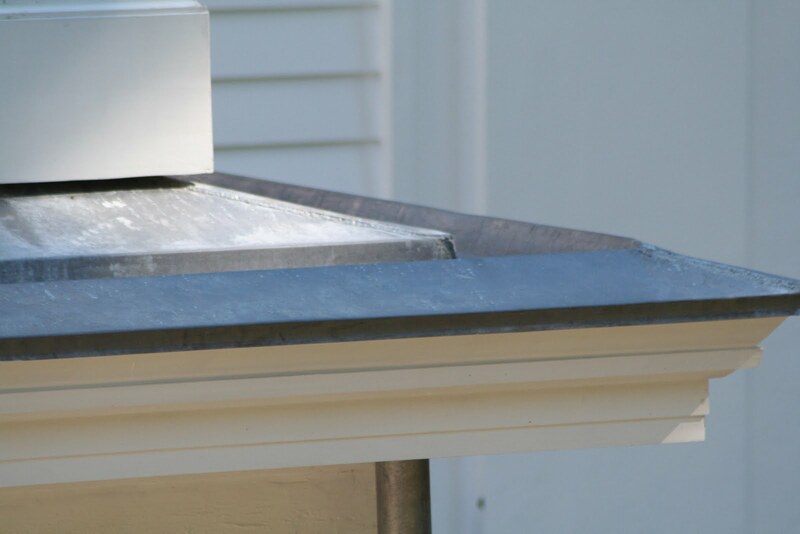 A built-in gutter, also called a box gutter and sometimes a Yankee gutter, is actually built into the cornice and integrated into the roof structure. The first gutters were actually troughs carved out of wood, either protected with linseed oil or painted. As sheet lead and copper became available these quickly became a popular way to line the gutter trough. Some folks make a distinction between Yankee gutters and built-ins. However, since they use the same materials and require the same maintenance, we see no need to differentiate between them in this discussion. A Hudson Valley Greek Revival home. From the ground the built-in gutters cannot be seen. A close look at the gutter on a corner of the house. So what can go wrong with built-in gutters? Typically these gutters were lined with tern coated steel. (Terne is an alloy coating that was historically made of lead and tin.) This type of metal needs to be painted and maintained about every 10 years. This maintenance is often forgotten, since the gutters cannot be seen. As a result of neglect, rust can develop. Once the metal begins to rust it does’t take very long to rust through. As water collects beneath the metal lining into the wooden trough beneath it, rot and decay begin. Another failure point is the seams that are soldered together. Thermal expansion puts stress on the joints that can cause them to break and then causes the same problem as described above. How do I know if my gutters are in need of repair? Often there is a visible sag or bow in the eave overhang. There may be rotten wood or water staining on the bottom of the soffit or box gutter visible from the ground. Faulty gutters are also a cause of water leaking into the house. 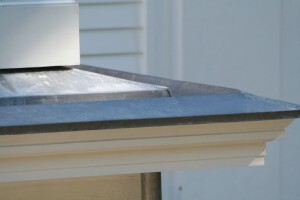 This built-in gutter has a visible sag at the far end and has started to pull away from the house. This has allowed water to run down the side of the house causing further damage. Should I have my built-in gutters inspected? Yes, even if you don’t see any damage. Especially if your gutters are more than 10 years old, or if they’ve never been inspected while you’ve owned the house. Built-in gutters must be cleaned on a regular basis, which is an excellent time to perfom an inspection. The gutter pictured here may not have had any noticeable damage from the ground. From up top we can see that the soldered seams in the copper lining had failed. The gutter had been coated with an asphalt product the seams could not be soldered over. Since the structure and pitch were still intact, this gutter was able to be repaired with an Acrylabs application. This demonstrates how early detection of a problem with your built-in gutter can keep repair costs down. What should an inspection of my built-in gutters consist of? 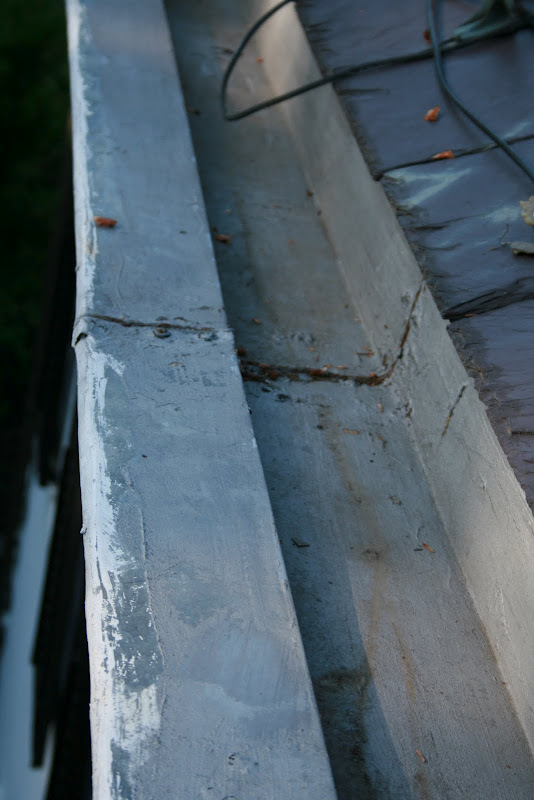 The seams in the gutter lining should be inspected to see if they are cracked. Also, check for holes or cracks in the lining, and inspect for water ponding. 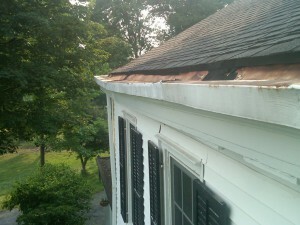 Finally, check the gutter structure to make sure it is well attached and not compromised by wood rot.